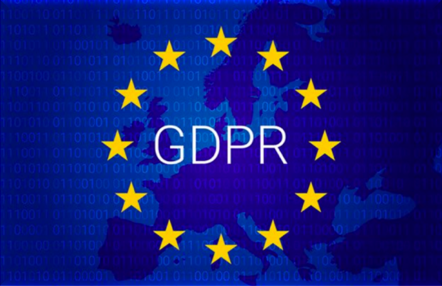 The European Union’s General Data Protection Regulation (GDPR) becomes law in May 2018. Aries has reviewed the regulation’s implications and taken steps to help Editorial Manager® journals implement compliance. Read more about GDPR plus view a helpful FAQ sheet. EMUG is a “must attend” event for publishing executives who have strategic responsibility for peer review. Aries Systems welcomes new users and returning participants to register for the 16th Annual Editorial Manager User Group Meeting. EMUG 2018 will take place at the Taj Boston Hotel in Boston, MA on June 21 and 22, 2018 and will include sessions dedicated to decision support tools, the Author experience and best practices (including Xtract), early decision workflow, Enterprise Analytics Reporting use cases, and more. View the agenda for additional details. To learn more and register, please visit our registration page. Now through May 18, discounted “early-bird” rates are in effect. Register early, space is limited. We hope to see you there! Company of Biologists recently announced the launch of preLights, a curated, aggregated resource for Preprint highlight discovery. CoB will host the content, which will be derived from preprints posted to bioRxiv. preLights features a summary of each preprint, the reasons it was selected and the selector’s thoughts on its significance. CoB uses Aries’ ProduXion Manager for production tracking. Read more. Peer Review Week, the annual event celebrating and advancing discussion of peer review, returns the week of September 10, 2018. This year’s topic is Diversity and Inclusion in Peer Review. Keep up with the conversation by following @PeerRevWeek on Twitter. Publishing in the changing climate of the research ecosystem is the theme of the 2018 CSE Annual Meeting. The meeting is being held in New Orleans, Louisiana from May 5-8. Aries staff will be on hand as sponsors, exhibitors, and moderators. Aries customers will also be among those actively participating to share knowledge with industry colleagues. These are the presentations you won’t want to miss! Implementing Standards: A Review of ORCID, CRediT and CHORUS – Lineup includes Aries Director of Product Management Tony Alves, as well as Alice Meadows of ORCID, Howard Ratner of CHORUS, and Tom Pacific from Wolters Kluwer. Emerging Standards: Harmonizing Data and Data Exchange – Aries Director of Product Management Tony Alves will moderate and present, with Crossref’s Patricia Feeney and Shelley Stall of the American Geophysical Union also presenting. Improving Author Experience – Lineup includes Siobhan Aldridge of Taylor and Francis presenting on Author Submission Portals (powered by EM Ingest), and Lindsay Morton of PLOS on Author Services. Other presenters include ACS’ Direct Correct, and IEEE’s use of Overleaf. New Innovations to Peer Review – Lineup includes JBJS’ Christina Nelson presenting Xtract, the new Editorial Manager submission interface capable of metadata extraction, also Tim Houle creator of StatReviewer. To read more about these and other CSE sessions, view the program agenda. Beginning in version 15.0, StatReviewer joins the comprehensive list of decision support tools integrated into Editorial Manager. StatReviewer analyzes the statistical and reporting integrity of scholarly manuscripts. Integration into Editorial Manager means that Editors and Reviewers benefit from automatic and comprehensive analysis at their fingertips. Read more about StatReviewer or view the FAQ. 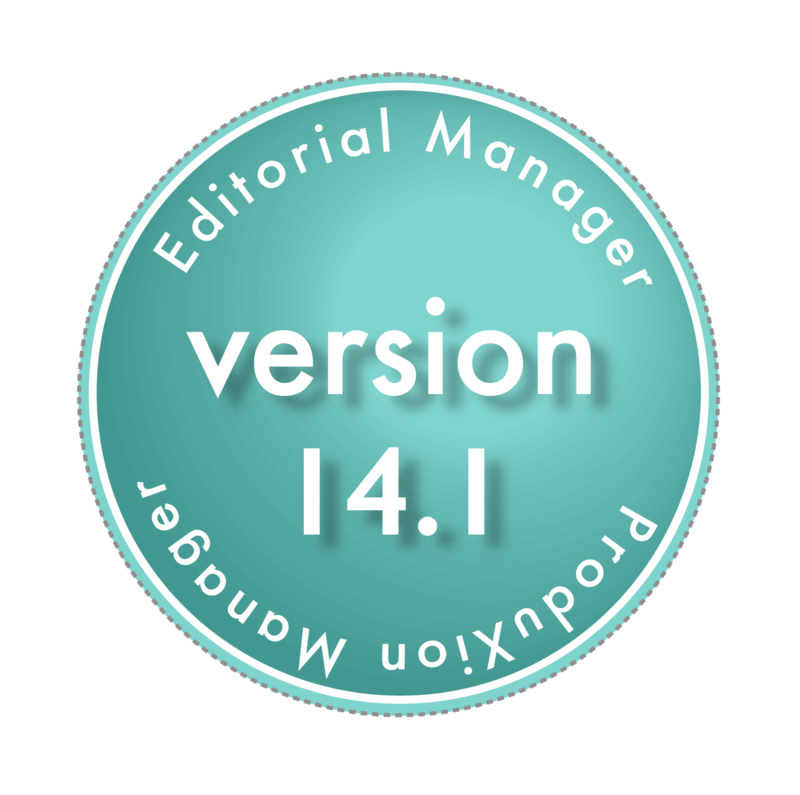 Editorial Manager Version 14.1 includes Xtract and a new submission interface that combines functional elegance with an updated design. Xtract automatically extracts text from the Author’s submitted Word file (including Title, Abstract, Authors and Affiliations), reducing the need for Authors to manually re-key data and resulting in a faster, simpler submission experience. To learn more about Xtract, watch this brief video overview. 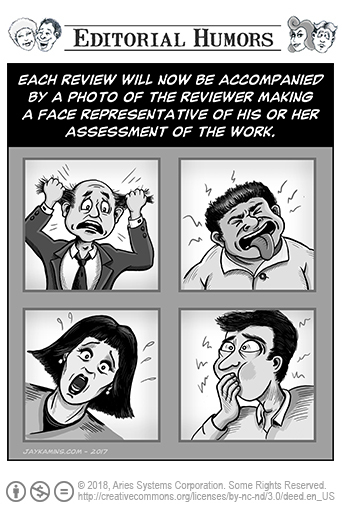 Editorial Manager Version 15.0 introduces ORCID Reviewer Recognition. This integration gives journals control over the data shared via the Reviewer’s ORCID record and maintains journal “blinding” policies while ensuring compliance with privacy rules by allowing reviewers to “opt in”. Journals can configure deposit “profiles”—for example, recognizing Reviewers only when reviews are of high quality, and submitted on time. Watch the video to learn more. Sign up to join beta testing today for early access to this new functionality. Go ahead, contact your Account Coordinator! Browse Aries’ Newsletter Archive for more Editorial Humors Cartoons. Need to bring an Editor up to speed on how to work efficiently within the system? Share these helpful experiential videos on the Editor experience.